I love the vibrant energy of New York City, but sometimes taking a day to get out and explore something new just hits the spot. One great location to do just that is Beacon, NY. This small town offers beautiful architecture, some fun food options, and a large modern art museum to boot. Take the train or hop in the car for a nice escape. If you’re traveling from NYC, hop on a Hudson Line Metro North train going to Poughkeepsie from Grand Central. If you’re traveling from Westchester, hop on the same train at the Tarrytown or Croton Harmon stations. For both, get off at the Beacon station. 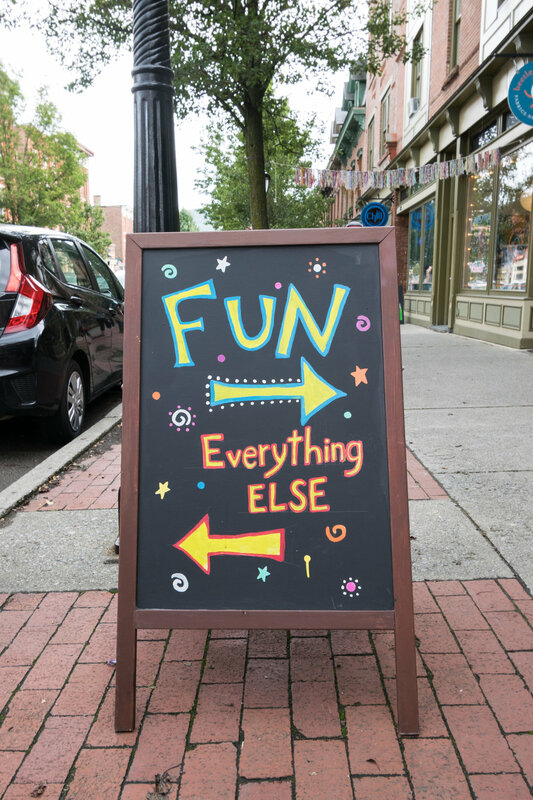 Everything in town is walkable from the station, so put on your comfy shoes and go explore! There is also a MNR Getaway combo ticket available for the round-trip train and entrance to Dia:Beacon for $39.50, definitely a deal! From NYC or Westchester County, take 9A to 9 to 9D. From Rockland County, take the Palisades Parkway and follow signs for the Bear Mountain Bridge. Once you cross over, follow 9D into town. There are a few parking lots right off Main Street that are free on the weekends, so park and get exploring. 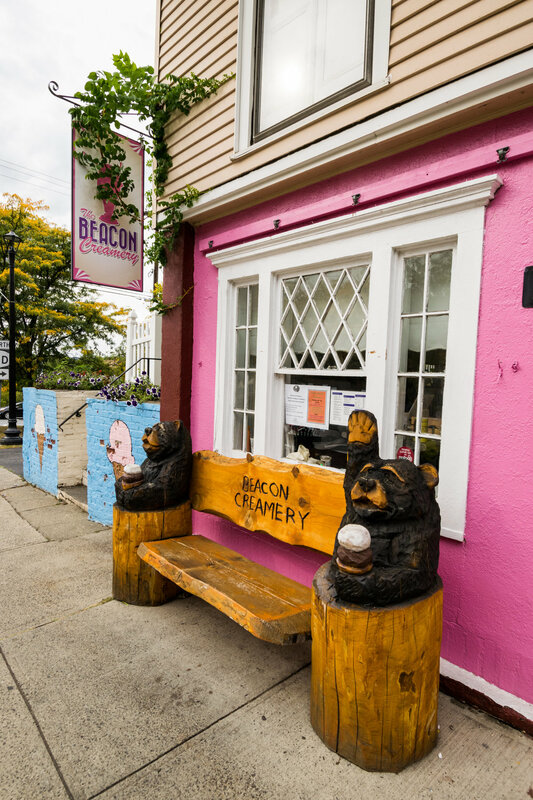 Depending on your starting point, it can take up to 1.5 hours to travel to Beacon, so once you arrive you'll probably be ready for lunch. If you're a Doctor Who fan, or if you just like creative themed interiors paired with good food, then Pandorica is for you. Enjoy the decor, and don’t forget to add a truly english touch to your order with a pot of tea. If you're like me, when you see a sign for homemade ice cream, you are required to go in. Beacon Creamery has a true small town, mom and pop feel, and I ordered a delicious milkshake before I set out to explore the shops. Once your appetite has been taken care of, set out along Main Street and enjoy popping into a few of the shops. For beautiful ornaments and other glass sculptures, head into Hudson Beach Glass. For unique and interesting gifts for friends (and yourself), definitely head into Dream in Plastic. I'm going to a day of the dead themed Halloween party this year, and I just had to pick these socks up for the occasion. After perusing the shops and enjoying the small town architecture to your hearts content, head towards the river and hang a left to Dia: Beacon. What once housed an old Nabisco box printing factory has been transformed into an expansive canvas for modern art. The collection spans from the 1960s to the present and is all shown in a wonderfully industrial setting (what can I say, I have a weakness for factory style big-pane windows). I’ll be the first to admit that I’m a fan of the classics (a semester abroad in Florence definitely cememnted that love), so while I have a harder time connecting with modern art, I still like to experience it once in a while to step out of my comfort zone and try something new. I did not love everything, but a few pieces did stand out. Some I admired for the pieces themselves, but more often for how they interacted with the larger space. If I'm honest, being an industrial architecture admirer... sometimes the building itself was the best part. And that's the thing with modern art, you get to make of it what you want, which is the fun of it for me. After contemplating what art is for a while, make your way back to the train station or to your car to make the journey home. I hope you enjoyed this day in Beacon, if you follow my footsteps or even just use one of the suggestions, please let me know in the comment section below about your experience!